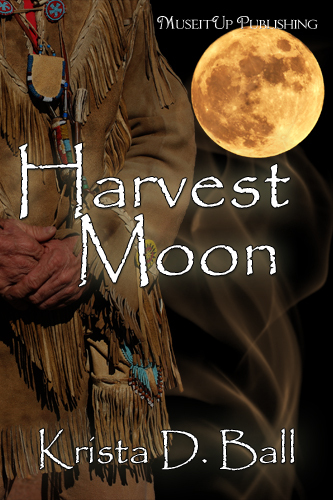 Harvest Moon, Krista D. Ball’s novella, is the short, and touching, story of Dancing Cat, a young woman on the fringe of her tribe, Battle Cliffs. Declared to be cursed by the Battle Cliff’s Wise Woman – her grandmother – Dancing Cat has had the freedoms she previously enjoyed striped away, and has spent two years being considered less than human by her band. She is reminded early in the story that if the band runs low on food in the coming winter, she will be the first to starve. This is her lot, what she gets for being cursed. The devastation Dancing Cat feels at the loss of the freedoms she once enjoyed, her loss of interest in life, is palpable and painful. Trying to piece together what she did to earn this position of Cursed One kept me as engaged as the moving, descriptive writing and imagery. Dancing Cat, desperate to escape this societal prison, breaks all social convention by seeking advice from her ancestors, which is forbidden for her as the Cursed One. What happens when her ancestor’s spirit intervenes changes her life. She is then at the mercy of her tribe’s long-standing enemy, and in a most unique manner. How it changes her life, I won’t tell you. Read and find out (to steal a phrase from one of my favorite authors, Robert Jordan). I very much enjoyed this novella, and it left me wanting more. If not more of Dancing Cat, since her story is told, then more of the Battle Cliffs and Red Valley tribes, more of their ancestors’ interference, more of Ball’s writing. Basically, I’m greedy and want more more more of this world Ball has created. For full disclosure: The author provided this story for an honest review. Visit the author’s Web site. Learn more about Harvest Moon from the publisher. This entry was posted in Book Review and tagged book review, first nations, historical fiction, native american, paranormal. Bookmark the permalink. Thank you so much for taking the time to read “Harvest Moon”. I’m glad (relieved!?!) that you enjoyed yourself! You’re welcome! I really did enjoy it.